The Cuisinart CDST1-S4JEG is a 16-piece ceramic dinnerware set, which is available in a variety of irresistible styles, shapes and colors. This dinnerware set is designed with vibrant colors and subtle textures. The dinnerware has dark & light matte finish and bright color glazes which create the perfect look for cozy vintage-style kitchens to glamorous dining rooms. It is a perfect choice for breakfast, lunch or dinner. The Jenna Green Dinnerware Collection Stoneware 16Pc Set has many exciting features for users of all types. See the Jenna Green Dinnerware Collection Stoneware 16Pc Set gallery images above for more product views. 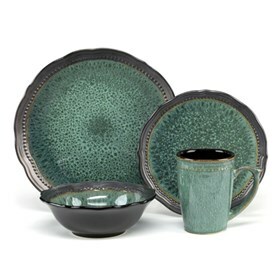 The Jenna Green Dinnerware Collection Stoneware 16Pc Set is sold as a Brand New Unopened Item.